P. Allen Smith visits Natchez, Mississippi and tours the newly restored Twin Oaks Bed & Breakfast and historic Ravenna House. Allen shares tips on how he decorated his basement to make it cozy, and roasts s’mores indoors in a fun and safe way. There is also a sneak preview of the Garden Home Challenge! 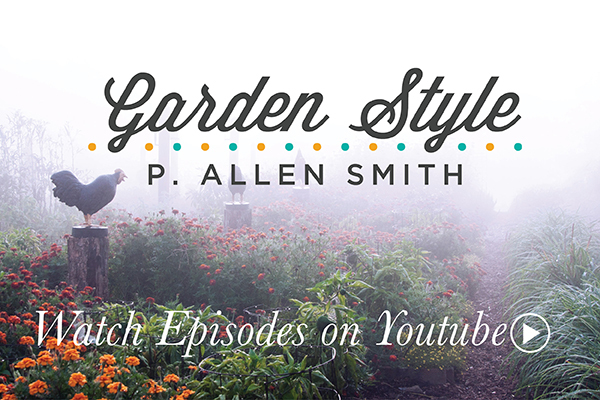 P. Allen Smith shares tips on decorating flower vases, adding garden ornaments to any landscape, and takes us along as he tours the fountains of Tower Grove Park in St. Louis, Missouri, the Monet Garden at the Garfield Park Conservatory in Chicago, and the unique sculptures at the Bernice Gardens in Little Rock, Arkansas. Allen shares the latest progress on the Garden Home Challenge. P. Allen Smith celebrates different seasons at Moss Mountain Farm with a lesson on growing tulips, using bold colors to make a huge impact on a garden room, and tips to harmonize color with summer flowering bulbs. On the road, Allen tours The Kauffman Memorial Gardens in Kansas City, Missouri. Allen shares the latest progress on the Garden Home Challenge. P. Allen Smith is keeping us indoors to talk about interior design with the help of a few friends. Plus, we get a little history lesson from Allen on how the sleeping porch became so popular. On the road, Allen tours the award winning Garfield Park Conservatory in Chicago. Allen shares the latest progress on the Garden Home Challenge. P. Allen Smith shows us an outdoor living space that serves as a sitting and dining area. Allen’s gardening tips include how to plant hostas in the shade and how to identify poison ivy. Plus, we learn about raising goats in the city and get a peek at a creative chicken coop. Allen shares the latest progress on the Garden Home Challenge. P. Allen Smith takes a step back in time on a whirlwind tour starting with Monticello, Thomas Jefferson’s home in Charlottesville, Virginia, where we learn about the historic plants in the estate’s gardens. Allen also visits Longwood Mansion, the largest octagonal house in the United States, a National Historic Landmark in Natchez, Mississippi; and the home of the famous architect, Frank Lloyd Wright in Oak Park, Illinois. Allen offers tips on how to make terra cotta look vintage. Allen shares the latest progress on the Garden Home Challenge. P. Allen Smith brings kids in the garden for some fun! They learn how to make flowers turn a different color, make mosaics with rocks and homemade salt dough, and assemble a birdbath for the garden. Allen takes us to the Children’s Garden at the Garfield Park Conservatory in Chicago, and the turn-of-the-century Children’s Farmstead in Kansas City, Kansas. Allen shares the latest progress on the Garden Home Challenge. P. Allen Smith visits The Bell Garden Community Garden in St. Louis, Missouri, where a unique garden therapy program has made a difference in people’s lives. Plus, Allen takes a bike ride to explore the beautiful colors of the autumn, and we visit the water garden at Powell Gardens in Kansas City, Missouri. Children from the Access School Kids program are welcomed to pick daffodils at Moss Mountain Farm, and Allen connects with the Adopt a Cat Program at the local Humane Society. Allen shares the latest progress on the Garden Home Challenge. P. Allen Smith shares tips on do-it-yourself projects at home and in the garden using broken terra cotta saucers, how to turn bulbs into party favors for guests, and using recycled Christmas lights and home fixtures to light a garden path. Allen showcases plants that make great screens for unwanted views and excellent ground covers at Moss Mountain, makes a trip to a special eco garden in Kansas City, Missouri, and shares the latest progress on the Garden Home Challenge. P. Allen Smith celebrates the summer season with a visit to the groundskeeper at Busch Stadium in St. Louis, Missouri, who shows us how to maintain a perfect lawn. Back home, Allen showcases the new summer foliage at Moss Mountain Farm, shares design tips using summer flowering bulbs, and how to grow beautiful dahlias. On the road again, Allen visits Grant Park in Chicago, where an urban beautification program is underway, where perfume is made from the oil of locally grown flowers. Allen shares the latest progress on the Garden Home Challenge. P. Allen Smith visits Arkansas’ newest cultural addition, the Crystal Bridges Museum of American Art where he gets a tour of the beautiful landscape surrounding the museum. While in Northwest Arkansas, Allen also learns about innovative environmental efforts to maintain quality landscapes. At Monticello in Charlottesville, Virginia, the home of Thomas Jefferson, Allen talks to the Director of Landscaping about the massive orchard. Back at Moss Mountain Farm Allen shares tips about maintaining Keiffer Pear Trees and planting marigolds, and uses chicken wire to make Ghost Maiden Dresses for Halloween. Allen shares the latest progress on the Garden Home Challenge. P. Allen Smith is gearing up for the Christmas Season with tons of fresh greenery and ways to use it inside the home, including fireplace mantles and a children’s room. Plus, he shows us how to make a simple cinnamon pinecone wreath and fun holiday luminaries. Allen shares the latest progress on the Garden Home Challenge. P. Allen Smith shows us ways to change out the seasonal décor in our homes from fall to winter, force bulbs indoors, recycle Christmas Trees, and attract birds to your yard in the winter. Plus, Allen shares some valuable tips on things you can do in your garden when it’s cold, to gear up for spring. Allen shares the latest progress on the Garden Home Challenge.